Directorate of Medical Education & Research has issued notification for filling up 528 Staff Nurse Vacancies. Applicants who are waiting for Mumbai DMER Recruitment Notification 2018, this is great job opportunity for you. 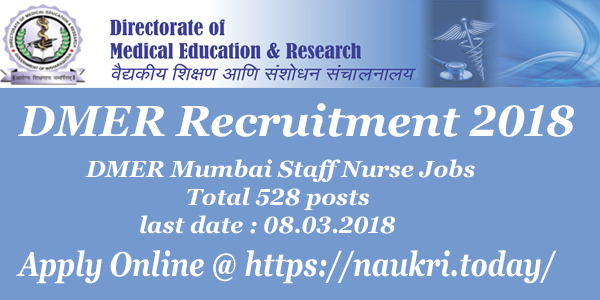 Interested candidates can submit online form for DMER Staff Nurse Vacancies on or before the last date 08.03.2018. Rest of the details about Directorate of Medical Education Mumbai Jobs you can collect from below article. 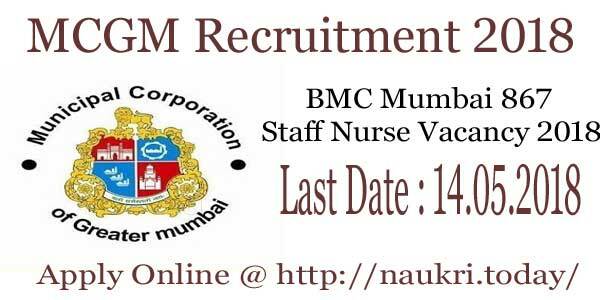 DMER Mumbai is inviting online application form for appointing qualified candidates on 528 Staff Nurse Vacancies. Online registration for DMER Vacancies has been started from 22.02.2018. Appliers must check required eligibility criteria before submit online form. To get full details about DMER Mumbai Recruitment like Eligibility, Pay Scale, Selection Criteria etc. then read the article properly. How Much Application Fee Required For paying DMER Mumbai Vacancy Online form ? How To Fill Online Form For DMER Recruitment 2018 – DMER Mumbai Online Form ? In this section we are providing Category wise division of DMWER Mumbai vacancies. Applicants can also check this details which is mention ion official DMER Jobs Notification. Candidates who are looking for DMER Vacancies Eligibility Criteria then read the below section. All information related to Staff Nurse Nurse Jobs Required Qualification is mention below. Candidates must have done B.Sc. Nursing or General Nursing Midwifery (GNM) or equivalent from any recognized University/ Institute for DMER Recruitment 2018. More details you can check from official notification. Minimum age of the candidates for DMER Recruitment 2018 must be 22 years & maximum age should be 38 years as on last date. Relaxation in age is applicable only for reserved category candidates as per organization rules & regulation for DMER Mumbai Jobs. General category candidates must paid Rs. 1060/- as application fees for DMER Vacancies. All other category candidates must paid Rs. 960/- for filling online form for DMER Mumbai recruitment 2018. Further information you can check from official notification. Selected candidates will paid a good salary as per organization norms for DMER Vacancies 2018. After Joining, Candidates will paid Rs. 9,300/– to 34,800/- with grade pay Rs. 4,200/- for DMER Staff Nurse Vacancies. Selection of the candidates for DMER Staff Nurse Recruitment will made on the basis of Written Exam & Interview. Full details about examination you can check from DMER Jobs Notification, which is mention below. Applicants who are interested & eligible for DMER Mumbai Recruitment can fill online form here till the last date. Follow the given below steps which is helpful for filling online form for Directorate of Medical education Mumbai vacancies. First of all candidates visit to the official website www.dmer.org. Now click on official DMER Staff Nurse Jobs Notification. Upload your photo & signature in form. recheck all details mention in DMER Jobs Online form. Now deposit application fees 7 click on submit button. Conclusion : DMER Recruitment 2018 For 528 Staff Nurse Jobs. Candidates can fill online form for DMER Mumbai Vacancies form here on or before the last date 08.03.2018. Check further information by reading the above article or from official notification.